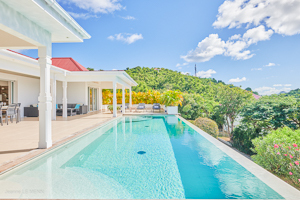 Villa UJV 286 is a three bedroom villa perched on the Colombier hillside, St Barts, offering a splendid view over Gustavia Harbor and the surrounding islands of Saba and St Eustatius. It is located just next door to one of the best bakeries on the island, where guests can easily walk to pick up their morning pastries and coffee. This newly redecorated villa features furniture by Parisian designer Meubles Gautier. The simple clean lines of the furnishings complement the spacious living room, which opens to the large terrace offering a pleasant, covered dining and living area. A breakfast nook separates the well-equipped kitchen from the inside living room. Two equal King Size bedrooms are located on each side of the living room terrace and face the view. The third bedroom, located in an independent cottage, offers the same amenities as the others. The large terrace surrounds the infinity pool, one that swimmers will enjoy! Comfortable lounge chairs invite you to relax or sunbathe while admiring the view. Villa UJV 286 is cooled by a comfortable sea breeze and offers sunny views by day and twinkling harbor lights at night.